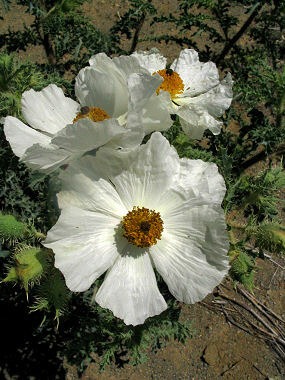 The Bluestem Pricklepoppy is a member of the Poppy Family. It typically grows in disturbed areas in fields and along roadsides at elevations between 1400 and 8000 feet. The plant typically grows to 3 feet in height and has blue-green jagged leaves up to 8 inches in length which are covered with sharp prickly hairs. Large numbers of this plant are usually a good indication that an area has been severely degraded due to overgrazing. 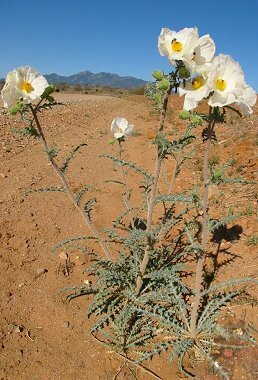 The plant can bloom any time between April and November and produces a large white flower with 4 to 6 tissue paper thin petals to 5 inches in width. Flowers are followed by an oblong, spiny seed pod to 1 1/2 inches in length. All parts of the plant are poisonous, however, the seeds are eaten by morning doves.